1.09 What delivery options are available? Standard delivery is two business days by 1pm if you order before the daily deadline on any business day, and costs £9.95. 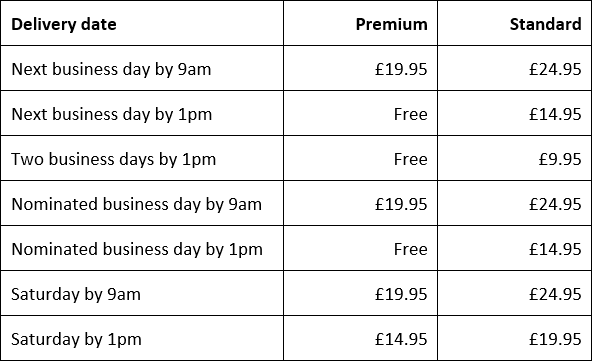 You can pay an additional fee for next business day, nominated business day, Saturday or 9am delivery. Premium delivery is next business day by 1pm or a nominated business day in the next 7 days if you order before the daily deadline on any business day, and is free of charge. You can pay an additional fee for Saturday or 9am delivery. We use fully insured Special Delivery Guaranteed services from Royal Mail, which will compensate you for late, lost or damaged deliveries. Exotic currencies may have an additional 1 day lead time. This will be clearly displayed during checkout so you know when to expect your order.